ArtStir Denver event celebration takes place in Denver Colorado in May. 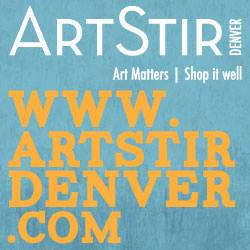 ArtStir Denver is a fun and vibrant art festival that happens over Memorial Day weekend. ArtStir features on LOCAL artists across all mediums. The festival is FREE to attend and will be offering a local colorado drinks and food portion in addition to the art booths. There will also be live entertainment throughout the weekend on the main stage! 80202, Art Events Colorado, Art Events Denver, Art Stir Denver, Calendar of Events Downtown Denver, Colorado Art Events, Colorado Creative, Colorado Creative Industries, Denver Colorado Events, Denver Colorado Events Calendar, Denver County Colorado Events, Denver Pavilions, Events 80202, Events Denver Pavilions, Things to do in Downtown Denver, Visit Denver, Visit Downtown Denver, Visit the Denver Pavilions, Visiting Denver, What to do in Downtown Denver?, Where is the Denver Pavilions?